Today, we are releasing the second preview of Visual Studio 2017 version 15.9, and it can be downloaded here. This latest preview contains new features and improvements to Universal Windows Platform development, C++ debugging, and export installation settings. Read more in the feature highlight summary below and check out the Visual Studio 2017 version 15.9 Preview 2 release notes for more details on all the new, exciting features contained in this Preview. In Visual Studio 2017 version 15.9 preview 2, we have a combination of new features and product enhancements for Universal Windows Platform developers. Read below to see what’s new! Latest Windows 10 Insider Preview SDK: The most recent Windows 10 Insider Preview SDK (build 17754) is now included as an optional component for the Universal Windows Platform development workload. 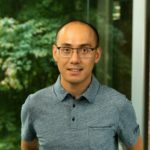 UWP developers can install this SDK to access the latest APIs available in the upcoming release of Windows 10. MSIX Package Creation: You can now create .MSIX packages in Visual Studio either through the Universal Windows Platform packaging tooling or through the Windows Application Packaging Project template. To generate a .MSIX package, set your Minimum Version to the latest Windows 10 Insider Preview SDK (build 17754), and then follow the standard package creation workflow in Visual Studio. To learn more about .MSIX packaging, check out this Build talk. F5 Performance Improvements: We have optimized our F5 (build and deploy) tooling for faster developer productivity with UWP development. These improvements will be most noticeable for developers that target a remote PC using Windows authentication; but, all other deployment types should see improved performance as well. 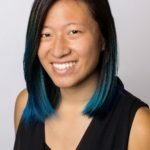 UWP XAML Designer Reliability: For developers building UWP applications with a target version of Fall Creators Update (build 16299) or higher, you should notice fewer XAML designer crashes. Specifically, when the designer tries to render controls that throw with catchable exceptions, the rendered control will be replaced with a fallback control rather than crashing the design surface. These fallback controls will have a yellow border (shown below) to indicate to developers that the control has been replaced. In Preview 2, we’ve added “Step Back” for C++ developers targeting Windows. With this feature, you can now return to a previous state while debugging without having to restart the entire process. It’s installed, but set to “off” by default as part of the C++ workload. To enable it, go to Tools -> Options -> IntelliTrace and select the “IntelliTrace snapshots” option. This will enable snapshots for both Managed and Native code. Once “Step Back” is enabled, you will see snapshots appear in the Events tab of the Diagnostic Tools Window when you are stepping through C++ code. Clicking on any event will take you back to its respective snapshot. Or, you can simply use the Step Backward button on the debug command bar to go back in time. You can see “Step Back” in action in concurrence with “Step Over” in the gif below. 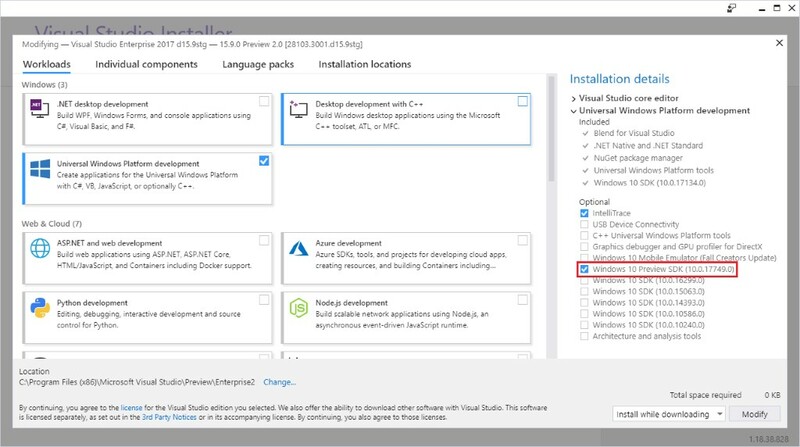 We’ve made it easier to keep your installation settings consistent across multiple installations of Visual Studio. 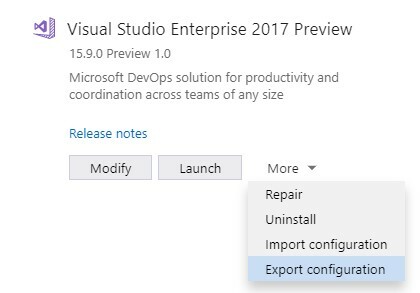 You can now use the Visual Studio Installer to export a .vsconfig file for a given instance of Visual Studio. This file will contain information about the workloads and components you have installed. You can then import this file to add your workload and component selections to a new or existing installation of Visual Studio. If you’re not familiar with Visual Studio Previews, take a moment to read the Visual Studio 2017 Release Rhythm. Remember that Visual Studio 2017 Previews can be installed side-by-side with other versions of Visual Studio and other installs of Visual Studio 2017 without adversely affecting either your machine or your productivity. Previews provide an opportunity for you to receive fixes faster and try out upcoming functionality before they become mainstream. Similarly, the Previews enable the Visual Studio engineering team to validate usage, incorporate suggestions, and detect flaws earlier in the development process. We are highly responsive to feedback coming in through the Previews and look forward to hearing from you. Please get the Visual Studio Preview today, exercise your favorite workloads, and tell us what you think. If you have an Azure subscription, you can provision virtual machine of this preview. You can report issues to us via the Report a Problem tool in Visual Studio or you can share a suggestion on UserVoice. You’ll be able to track your issues in the Visual Studio Developer Community where you can ask questions and find answers. You can also engage with us and other Visual Studio developers through our Visual Studio conversation in the Gitter community (requires GitHub account). Thank you for using the Visual Studio Previews.